Priyanka Chopra is on a style roll. After stunning us with her feathered gown at Emmys 2017, the actress turned heads in a white gown on Tuesday night. She was seen wearing a long-sleeved gown at the Goalkeepers Global Goals Awards in New York City. She looked like a vision in the white gown with puffed sleeves. The gown was cinched at the waist, which flaunted her curves. It also had a middle slit, which looked like a wrapped skirt. She rounded off the look with ivory coloured earrings and stilettos. Her make-up was radiant with a hint of shimmery shadow and rusty brown lipstick. And for her hair, she sported the side-swept waves over one shoulder. 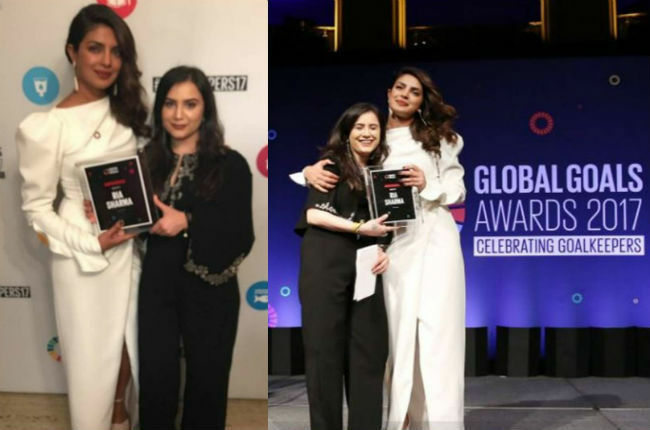 Priyanka presented the Leadership Award to Ria Sharma from India for her work for acid attack survivors. Ria is the founder of Make Love Not Scars (MLNS), an organization that active that actively supports survivors of acid attacks physically and mentally, and campaigns to raise awareness of the issue. ”Ria’s efforts are contributing to change the lives of many women who have survived acid attacks. MLNS have ensured that survivors receive free treatment under the Supreme Court order for the welfare of acid victims passed in April 2015″, said Priyanka in a statement. Priyanka Chopra is not just a diva in the showbiz world. She’s one of the few actresses who’s constantly making an effort for the social causes. She’s also the goodwill ambassador or UNICEF, where she actively participates in creating awareness for Syrian refugees. Now, the actress took this platform to talk about the importance of women empowerment and peace. “In the words of Mahatma Gandhi… ‘If we are to teach real peace in this world, and if are to carry on a real war against war, we shall have to begin with the children.’ It was an honor to speak at the UN Global Goals Awards on the importance of empowering girls; addressing global leaders and influencers from the United Nations, philanthropy, media, non-profits and business. We all need to come together and work to empower, educate, create opportunities and impart skill sets so that we can be their catalysts for change and to help them build their brave new world. If possible, a safe one where they can live their dreams and laugh together as one,” Priyanka stated on her social media accounts.